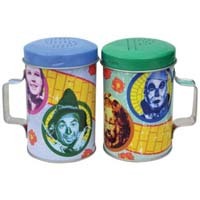 Four Friends Tin S&P Shakers | Wizard of Oz Globes & More! Figurines | One Price Low Flat Shipping! From the Wizard of Oz Gift Collection by Westland Giftware, Four Friends Tin Salt & Pepper Shakers. Made of tin. Measures 4" tall. This retro styled tin salt and pepper shaker set features Dorothy and her traveling companions, the Cowardly Lion, the Scarecrow, and the Tin Man.